Sometime this year, the agreement between Microsoft and Yahoo will see Yahoo's web-search replaced with results powered by Bing's technology. One of the greatest concerns from an SEO's perspective, is that we will probably lose one of the more useful backlink analysis tools that exists, Y! Site Explorer. 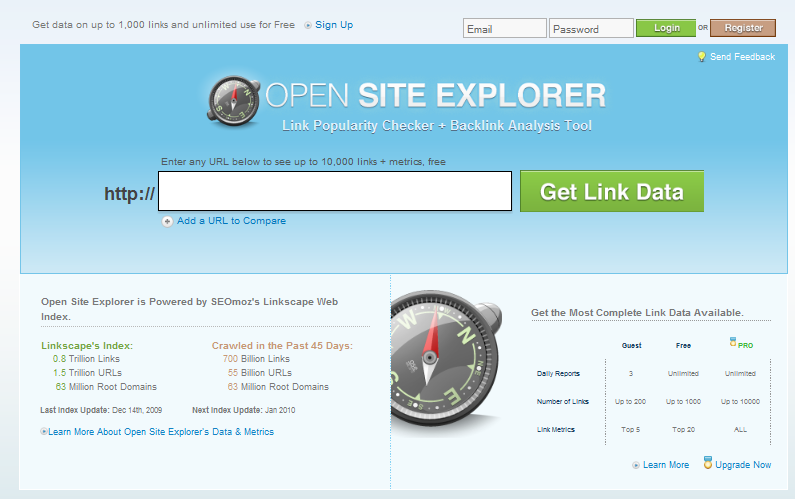 However, our friends at SEOmoz have today announced a potential replacement, powered by data from their tool Linkscape. The basic view for a particular URL shows four headline figures: the Authority of the page and the domain, as well as the number of links and linking domains. Below this is a list of the links to the given URL, along with the anchor text used, and the page & domain authority for the link. Unregistered members can see 200 links, with full details on the top five. 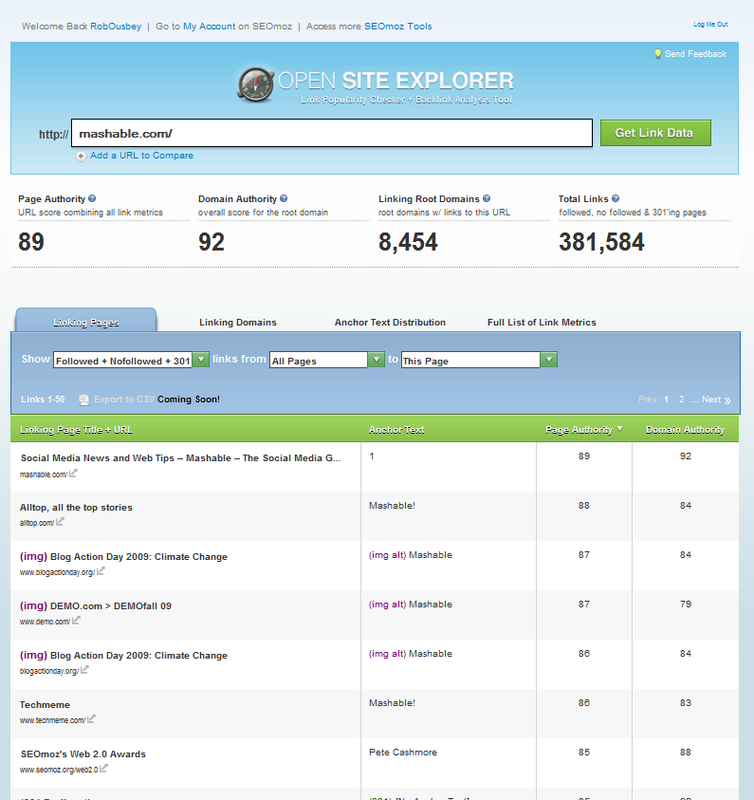 Registered SEOmoz members (registration is free) gives access to 1,000 links and full metrics on the top twenty. 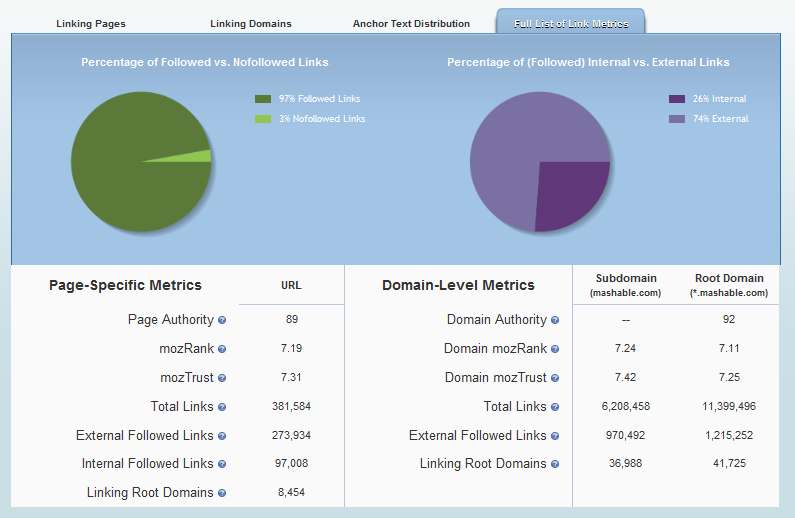 SEOmoz PRO members have access to 10,000 links, and can see the full metrics for them all. The data from Open Site Explorer is made all the more useful by the powerful 'filter' options shown above the link list, which allows users to see only the followed links, the nofollowed links, pages which 301 to this URL, etc. There are also filters that will be familiar to Y!SE refugees, such as showing links from only this site, only external sites or both, and showing links to just this page or a full domain/subdomain. Other tabs show aggregated data about the linking sites and anchor text, and the full list of page and domain level metrics (seen below) which includes raw link numbers, and calculated values such as mozRank, mozTrust and Authority. 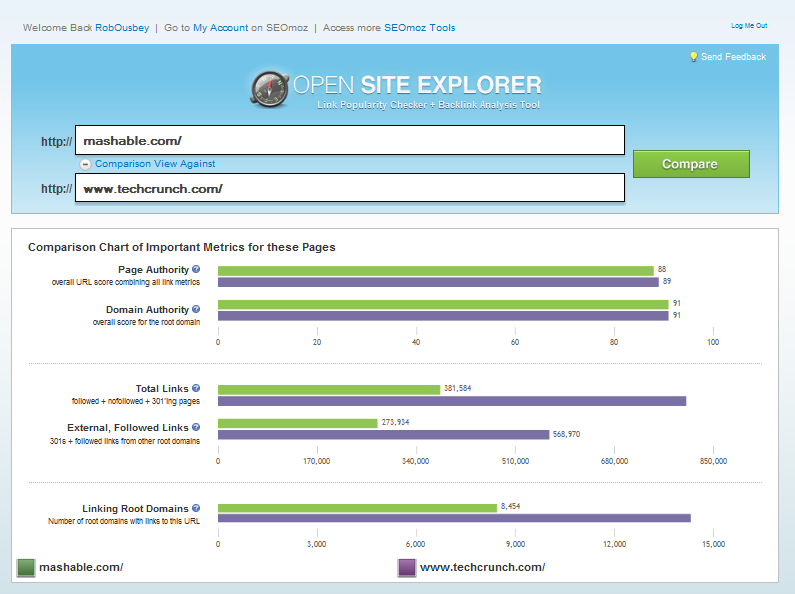 The comparison report, shown above, is a quick overview that lets you see the link data for two URLs side by side. Below these graphs is a list of the links to each page. The links pages indicate that a CSV export of the data will be available in the future. The team have also published a 'feedback' link, to share your thoughts on the tool and offer your own suggestions. There have always been benefits to SEOmoz membership - both the free and the PRO options - but this new site has just added another tool to the toolbox of every SEO. Furthermore it shares information that search engines have been reluctant to publish, and puts backlink analysis within the reach of webmasters who haven't been able to access such data before. You can use the tool straight away, or register for an account to access the additional data.